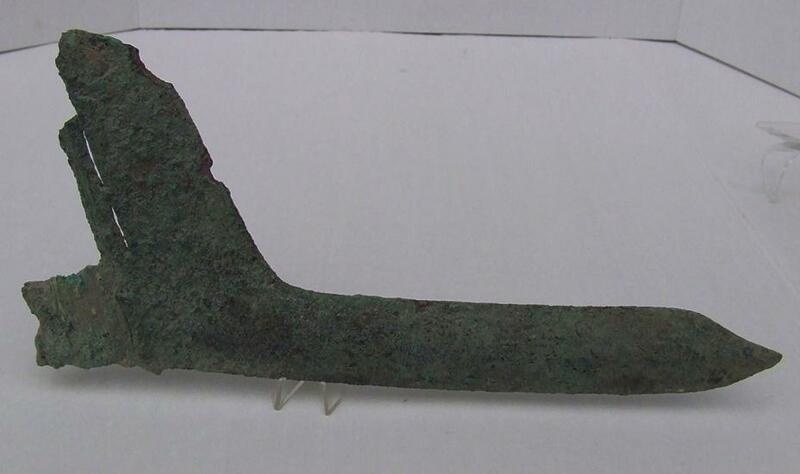 An authentic ancient Chinese huge bronze Ge (dagger-axe) halberd blade that dates to the Spring and Autumn period (770-476 BC) of the Eastern Zhou Dynasty. 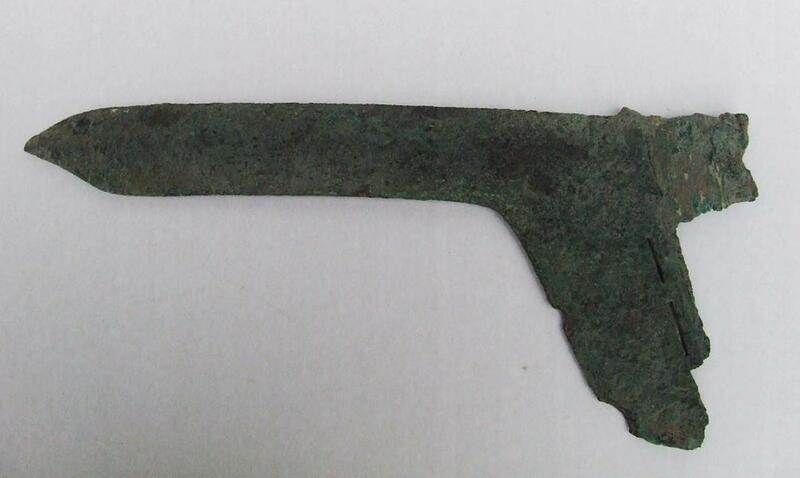 The Ge is considered the most characteristic weapon of ancient China, having been wielded by warriors during the early Dynasties of Shang, Zhou and Han. Its use in war was restricted to only this most ancient period of Chinese civilization, as such its distinctive form has come to be seen as symbolic of this golden age. The blade was designed as one component of a type of halberd known as a ji (Ÿ), a composite weapon made from a double mounting of the Ge with a mao (spear) set above it on a single pole. 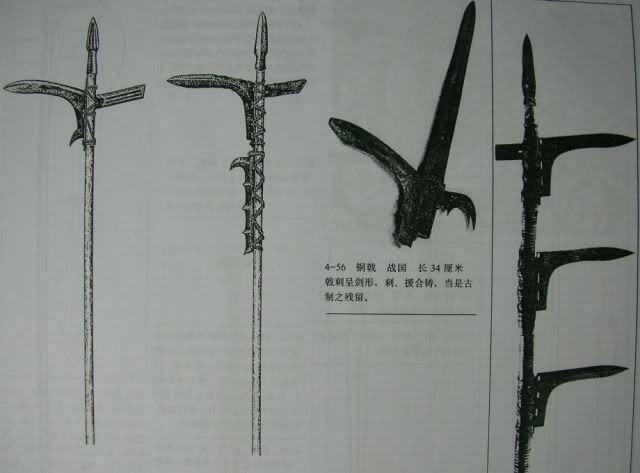 This provided a greater versatility in application since a ji armed warrior could thrust with the spear point and hook or puncture with the dagger-axe blade. MEASUREMENTS: overall length: 33 cm (12.99 inches), Height: 14.5 cm (5.71inches). 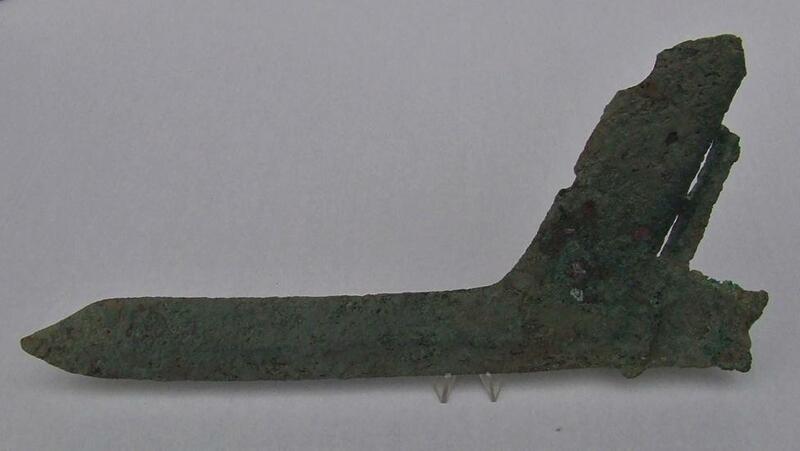 CONDITION: Showing the age and usage, dark green patina with earthen deposits, the blade is, chipped. REFERENCES: The Path to Victory: Exhibition of the Art of War and Fine Antiques of the Ancient Chinese Military. By ZHONG GUO REN MIN GE MING JUN SHI BO WU GUAN BEN SHE.